Llamas operate as some of the hardest working creatures in the animal kingdom. They are good for performing many different types of tasks. They can do many jobs, but this article will talk about some of the ones that llamas are most known for as well as offer you some tips for llama ownership. A healthy, full-grown llama can carry a large part of their body weight for about eight hours which makes them about as strong as the average horse. For much of their history, llamas have carried very heavy loads through rough terrain for thousands and thousands of years. Their intelligence and calm demeanour have helped groups such as the Incans march through the Andes. These traits make llamas the preferred pack animal for hikers today. 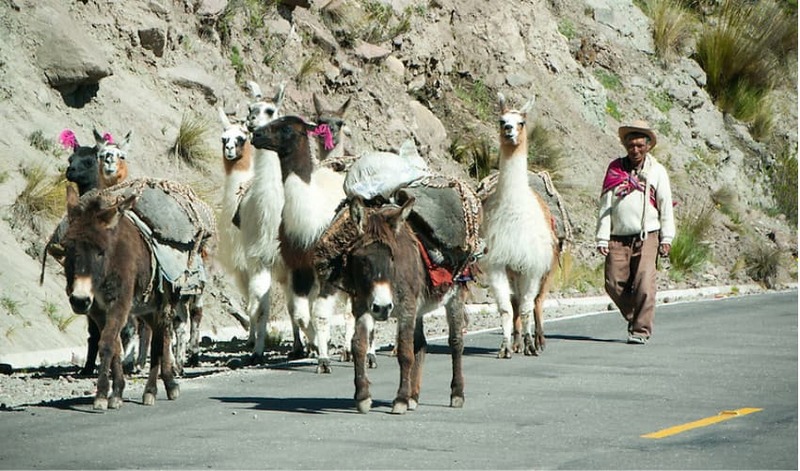 Pack owners often load down their llamas with up to 80 pounds for treks up to 10 miles. Llamas are nimble, making them able to navigate some of the most difficult hikes. Many hiking organisations also rely only on llamas and they also do less damage to the terrain than hooves can, coupled with the fact they are nimble foragers, which means that they do a lot less damage to plant life than deer. Because of their steady walking pace, many hikers like to take llamas on their treks. Llamas are also neat as they put their odourless waste in a pile with those of other llamas. As a result, cleaning up after them is a lot easier than doing so for other animals. Don’t think that llamas can’t guard your flock! Some research says that llamas can make terrific guard animals. For one thing, they can protect other animals such as sheep from predatory animals. Llamas can start guarding flocks at two years old. They can continue to do so for as long as they remain healthy. Both male and female llamas can guard flocks equally well. While many of us don’t think our llamas can serve as draft animals, they can actually pull carts really well. They can pull carts either in a team or by themselves. You can get speciality two-wheeled carts made for llamas in many different places. Llamas can become great draft animals if you train them well. While you can train your llama to pull carts, some llama owners even train their animals to drive a cart in in different parts of the world. Should You Get a Llama? Llamas have become popular over the years. Here are a few factors that you will need to consider before you get a llama. Llamas require shelter from the elements: While llamas can live in a lot of different climates, owners who live in extreme climates will need to build sturdy shelter structures for their llamas. Those owners who live in extremely cold weather need a shelter that protects their llamas from the snow and cold. Those that live in warmer weather should have llama structures circulating air. What Can You Expect From Your Llama? To have the best experience with your llama, you will need to have realistic expectations. Llamas can get along with your other animals. However, you shouldn’t expect them to act like your horses or goats. For one thing, llamas operate as smart, calm and curious animals. They can also be playful and curious. While llamas are clean, playful, and trainable, don’t expect them to be house pets. While llamas act as a low-maintenance animal, they still need some attention from you. You will need to pay more attention to pregnant llamas. Get to know your llamas so that you can tell if they’re distressed in any way. Llamas don’t complain easily, so they tend to hide any type of sickness or pain. So by knowing your llamas’ signs of distress, you can become a better owner. Never buy a llama younger than six months. Baby llamas need to stay with their mothers until they are weaned. If you buy a young llama, try to keep your contact with them to a bare minimum. Llamas not sufficiently weaned will treat humans as other llamas. Get advice from a breeder or veterinarian before getting a young llama. You have to train your llama to get used to a halter. But leaving them in a halter day and night is not only cruel. It’s also really dangerous. Leaving your llama in a halter for long periods of time can result in calluses, ulcers, and other types of injuries. Only put a halter on your llama when it is absolutely necessary. Take them out of it as soon as possible. If your llama isn’t breeding, they can do very well eating hay, getting pasture, water, and minerals. Breeding llamas need a special type of feed. All llamas need access to salt and minerals. Llamas don’t like the heat. If you house your llamas in an enclosed shelter, they need protection from the sun as well as fresh air circulating in their enclosure. If the heat gets really high, give them a bath or hosing. Those that have heavy wool should get sheared every spring. Llamas like to eat plants as part of their diet. But vegetation such as wilted cherry and rhododendron are poison to them. Look for a full list of these toxic plants at the websites of associations dedicated to llamas and other camelids. Thats easy, just use a taxi. Spotted in Cusco, Peru … I think that Llama is a regular taxi user, just hopped right in. The Llama Experience is an exclusive 2-3 hour treat for two people to Meet, Groom & Walk your own llama followed by some very fine food & drink whilst you relax in the Llama Lounge.